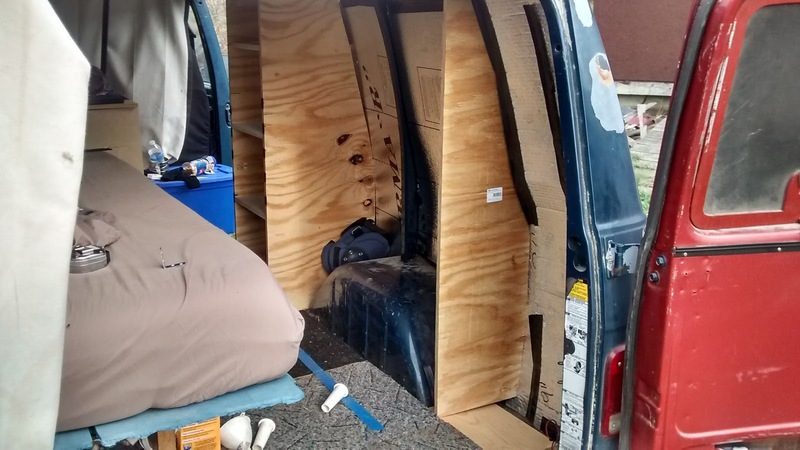 A bed across the back is probably the best use of space in a van, but when I tried to go back to it, my ankles didn't agree. I started getting some pain there, I guess from not being able to stretch out. 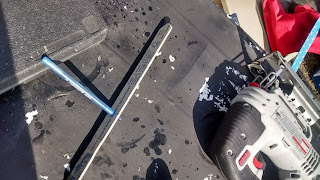 So the bed had to go lengthwise, and this means I was looking at a mess of stuff and no organization I find acceptable, especially if I planned to take my tools with me on the road. 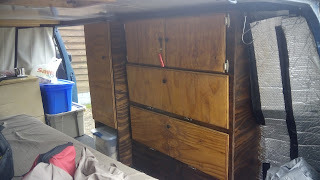 So I redid my bed to make it more stable, and decided to make some storage cabinets. I don't have money to waste, and the only home improvement around is lowes, so I was left with pretty low quality wood. I bought 3 sheets of pine for $22 each, part of 1 sheet will make the platform top for my bed, and the leftovers will help make doors and shelves. The vertical pieces of the cabinet are cut from the factory edges of the other sheets. For simplicity the cabinets were 4 feet high, not exactly to the ceiling. But since there is no top piece they functionally are that tall. Saves on wood and time. 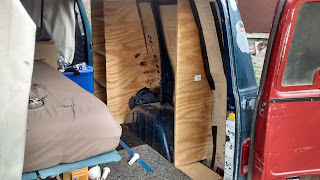 The bed is a simple box frame with the 2x3s with plywood on top, done the same way as my old bed (except all one piece) and the shelf I made previously for my tools. The only difference was I left the front bottom board off this time, so I could slide stuff under easier. I put a leg in the center for added support but Im not even sure its needed, its pretty stable once you screw the top down. Since I wanted to save as much wasted space as possible, I made the cabinets frameless, so no 2x3s were needed. I wanted to use all the space, even the curved space on the walls, so I made foam templates that follow the contours. This can be a pretty tricky and annoying manuever, but it was very easy using a pointed (cut a point) paint stick with a pen drilled through it like below. You push the tip of pen or pencil against the template, and follow the contours of the wall with the pointy end of the paint stick. You could probably save time and just use the actual wood instead of the foam, but I wasnt sure how well this was gonna work, so I didnt want to try it first with wood. I just traced it onto the wood then cut it out with a jig saw. I reproduced it 3 times (actually 4 with one cut to fit over the wheel well, but I discarded it later). The front most section is for clothes. I wanted an actual closet for hanging clothes, but in a low top van it was just too wasteful. The other section would have 3 larger sections (2 shelves), the bottom one encompassing the wheel well. 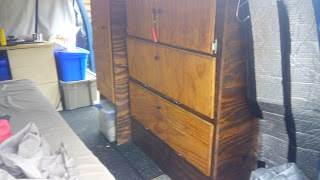 The top section would be smaller because of the curve of the van, I decided to split it into 2 small cabinets. 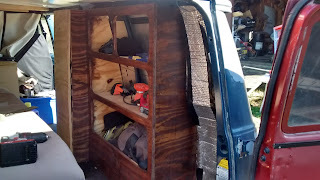 I used a pocket hole jig to connect the shelves, along with L brackets to connect the verticals to the van floor and the steel van ribs. Each vertical sits besides one. 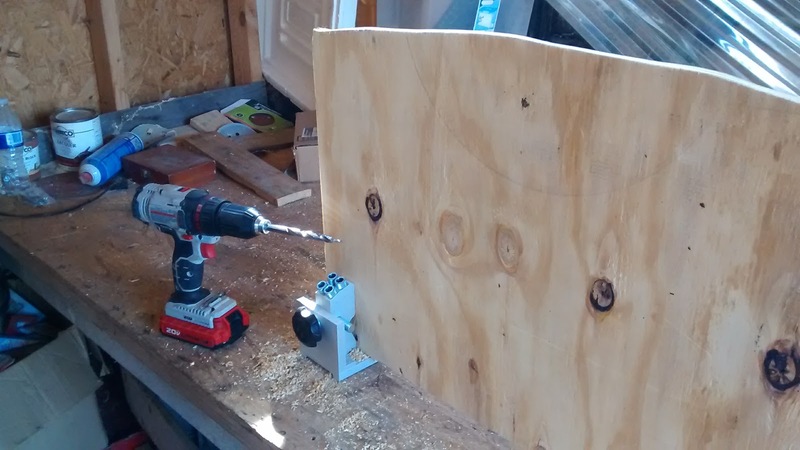 A pocket hole jig (kreg) is super easy to use, and saves a ton of money on L brackets or fasteners. The cabinets still need a face to attach the doors to ( tho you can get frameless hinges like I use for the closet door but they are more expensive and don't work for this application). I picked the least warped of a warped bunch of wood and cut out the holes for each area with the jig saw. I used the selves to measure how big to make them, then left a couple inches around for hinges to attach. I then used a roundover bit in my router to round the openings. I used pocket holes to attach the face to the closet. 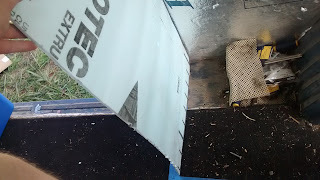 Since I cant get a drill inside the back end of the cabinet to screw it in on the other side, I pre-attached L brackets to the face, a boards thickness from the edge, and slide them inside against the back vertical, then screwed the L bracket to it from the side. Voila. 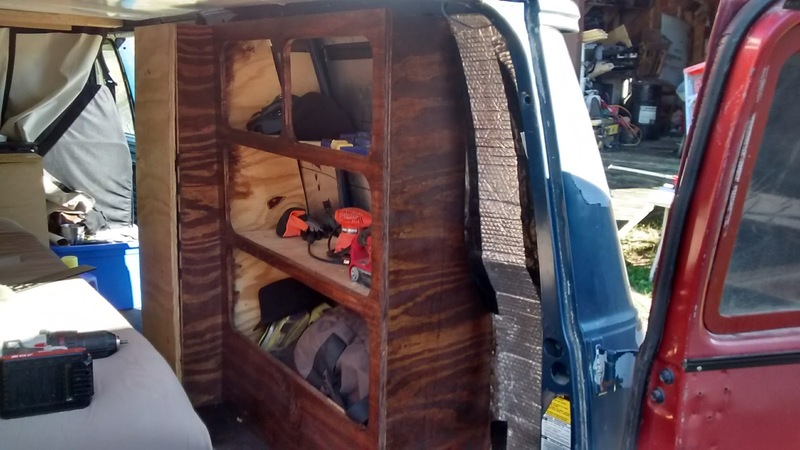 At first I was going to make the closet from the top to bottom of the van, but decided I'd rather have an open space on bottom for easy access to some things without opening the door. If there was any place that the selection of cheap wood was going to come back and bite me, it was with the doors. None of the larger doors sit flush against the wood, so magnet hardware had to be placed where the wood isn't bowed away. To not complicate it even more, I decided to make them square and abandon the jig saw for my tracksaw. 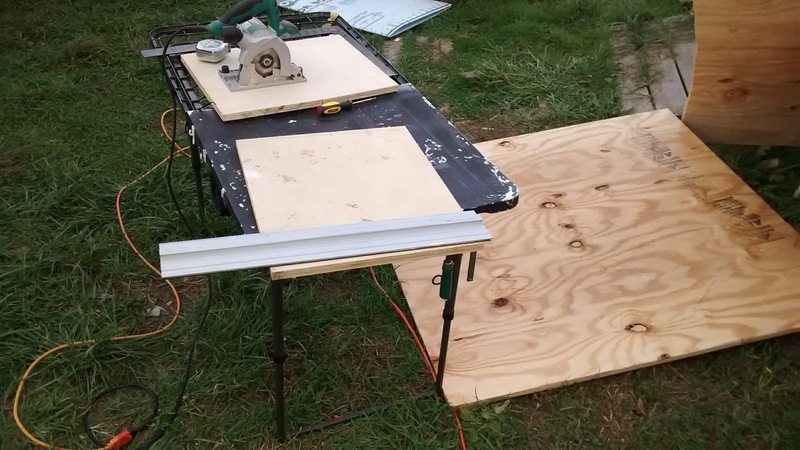 Think of a tracksaw as a portable table saw for sheet wood, or a circular saw for people who can't cut in a straight line but have to. :) They are normally way to expensive for regular DIY dudes, but they make off brand ones that get the same job done. It doesn't look bad, but its hard to keep the magnet strongly connected if the connection isnt flush. So I have to put 2 magnets on one of the big doors, as it opens down (gravity is against it). So 2 magnets for $2 is cheaper than spending $50 on higher quality wood that might not be as warped. Added some $1 door pulls and some stains and I am very pleased. There is still enough room next to my bed for my potti and to sit my feet down or store something large if I have to, like more wood. Now to just figure out what to put in all my delicious vertical space.